Interstate 83 (I-83) is an Interstate Highway in the Eastern United States. Its southern terminus is in Baltimore, Maryland at a signalized intersection with Fayette Street; its northern terminus is in Harrisburg, Pennsylvania at I-81. The Jones Falls Expressway, known to local residents as the JFX, is a 10.2-mile-long (16.4 km) freeway that carries I-83 from downtown Baltimore to the northern suburbs. It is the area's true north–south artery, because I-95 runs mostly east–west through the city. Its southern terminus is at Fayette Street, and its northern terminus is at Maryland Route 25 (MD 25), just north of the Baltimore Beltway (I-695). Inside Baltimore, the road is maintained not by the Maryland State Highway Administration, which controls most freeways in the state, but by the city's Department of Transportation. The freeway begins at an at-grade four-way intersection between the Jones Falls Expressway, Fayette Street, and President Street, located in close proximity to the Phoenix Shot Tower. President Street continues south along the eastern edge of the central business district (CBD) to terminate at a traffic circle in Harbor East. Fayette Street serves as an access route into the downtown area. Passing beneath the Orleans Street Viaduct (part of US 40), the JFX runs north, passing near the Washington Monument. Between Exits 3 and 4, there is a 90-degree turn that sometimes requires motorists to slow down just before entering it, with an advisory speed posted at 40 miles per hour (64 km/h) . The curve is located between the Guilford Avenue and Preston Street overpasses. Within the curve, the southbound JFX interchanges with MD 2, with an exit to St. Paul Street and an entrance from Charles Street. Having passed this curve, the JFX begins to parallel MD 25, going under the Howard Street Bridge and interchanging with Maryland Avenue and North Avenue (which carries US 1 and US 40 Truck) before continuing north past Druid Lake, forming the northeastern boundary of Druid Hill Park. Running northwest out of the city center, the JFX is paralleled by its namesake river, the Jones Falls, on one side, and MTA Maryland's Baltimore Light RailLink line on the other. Closer to downtown, the light rail line peels off in a different direction, while the Falls flows directly underneath the elevated freeway. After interchanging with Cold Spring Lane and Northern Parkway (between which lies the Cylburn Arboretum), the JFX exits Baltimore, entering Baltimore County. Passing close to Mt. Washington Pediatric Hospital, Mount Saint Agnes College, and Jones Falls Park, the route skirts the edge of Robert E. Lee Park before interchanging with Ruxton Road just south of the Baltimore Beltway. At the Beltway, I-83 leaves the JFX and joins I-695 for a distance of 1.4 miles (2.3 km), where it separates from the latter route to continue onward into northern Maryland. Meanwhile, the JFX continues for another 0.5 miles (0.80 km) in a four-lane divided format before terminating at an at-grade intersection with MD 25 Falls Road. I-83 and I-695 split off at the southern terminus of the Baltimore-Harrisburg Expressway, and I-695 continues its eastward trek towards Towson and Parkville. After separating from the Beltway, I-83 is now known as the Baltimore-Harrisburg Expressway. Running due north away from the Beltway, the route parallels MD 45 York Road, the former route of US 111. Passing to the west of Timonium and Cockeysville, I-83 leaves the suburban belt around Baltimore and enters rural Baltimore County just north of Hunt Valley at Shawan Road. I-83 and MD 45 continue to parallel one another through the northern portion of the county, with MD 45 crossing over I-83 once, at an interchange. This segment of I-83 has several sections with higher than usual gradients. The only major settlement encountered by I-83 along this stretch is Monkton, reached via MD 137. To the west of I-83, MD 137 connects with the northern terminus of MD 25, I-83's former companion to the south. The Interstate eventually crosses the Mason–Dixon line into York County, Pennsylvania, 25 miles (40 km) north of Baltimore, mere feet from a partial interchange with Freeland Road and parallel with MD 45; the latter route becomes the Susquehanna Trail when it reaches Pennsylvania. Throughout Pennsylvania, I-83 is named the Veterans of Foreign Wars of the United States Memorial Highway. I-83 enters Pennsylvania crossing the Mason–Dixon line and passing to the east of Shrewsbury, and runs due north towards York. The route bypasses the boroughs of Loganville and Jacobus before entering the city of York. I-83 has a business route through downtown York, known as Interstate 83 Business. The business route follows the former path of US 111, while I-83 turns northeast and then north again to bypass the urban area. Near Pennsylvania Route 462 (PA 462), the Lincoln Highway, the interstate turns west for a short distance, then north again to interchange with US 30. Beyond US 30, I-83 resumes its straight path, running due north out of York and passing to the west of Emigsville. North of Pennsylvania Route 297, I-83 is known as the Susquehanna Expressway. It maintains this name as it passes to the south and west of Valley Green, continuing north towards Harrisburg. South of Harrisburg, I-83 interchanges with I-76, the Pennsylvania Turnpike. North of I-76, I-83 continues due north, passing through New Cumberland, before an interchange with PA 581 in Lemoyne. After the interchange with PA 581, I-83 is known as the Capital Beltway. The highway turns due east and crosses the Susquehanna River over the John Harris Bridge, south of Harrisburg's central business district, passing through Paxtang before encountering I-283 and US 322 at the Eisenhower Interchange. Within the interchange, I-83 exits from itself, with each direction of traffic following a one-lane ramp; facing east, I-83's former lanes become US 322, while, facing north, I-283's lanes become I-83. The interchanges includes ramps to local city streets as well. From this point northbound to exit 51 traffic is often congested during daylight hours. I-83 and westbound US 322 continue north toward US 22 and I-81, I-283 goes due south toward the turnpike and PA 283's western terminus, and eastbound US 322 goes due east toward Hershey. Beyond this interchange, I-83 runs due north again through eastern Harrisburg, interchanging with US 22 northeast of the central business district, before terminating at a three-way semi-directional interchange with I-81. I-83 was one of the first Interstate highways in Pennsylvania to be built. Much of its routing through the state follows a freeway bypass of the since decommissioned U.S. Route 111. The route received the I-83 designation in 1960. The first section to be built, opened in 1954, runs from Pennsylvania Route 392 in Newberry Township to Pennsylvania Route 114 in Fairview Township. The entire highway was completed in 1971, after construction of the massive Eisenhower Interchange was finished. The first Interstate to be built in Baltimore was the Jones Falls Expressway (JFX); the Greater Baltimore Committee pushed to enact legislation from the Baltimore City Council in 1955. It was the first to be constructed due to community opposition to the other planned freeways within the city. By the early 1960s, the JFX was completed as far as Guilford Avenue, within the city limits. It was completed as far as Pleasant Street in the downtown area by 1983, but the remaining 4.4 miles (7.1 km) to I-95 were cancelled in September 1982. To compensate for the loss of the remainder of the JFX, the portion in situ was extended to Fayette Street by 1987, and the Jones Falls Boulevard project substantially rebuilt 0.75 miles (1.21 km) of President Street, across from the JFX at Fayette Street, to allow the traffic to and from the Interstate to be collected and distributed from the surrounding city streets. By 1990, the project was completed. Due to community opposition to the other freeway plans being produced by city officials, the JFX was the very first limited-access highway to be completed within the city of Baltimore, and remained so for several years. Originally, the JFX was to continue through the Southeast Baltimore neighborhoods of Fells Point and Canton to a junction with the then-planned I-95, but opposition from residents of those neighborhoods successfully blocked that proposal. As a result, I-83 became the first Maryland road in the Interstate Highway System. As part of the planning for an east–west route through Baltimore, the alignment of the JFX underwent various modifications. 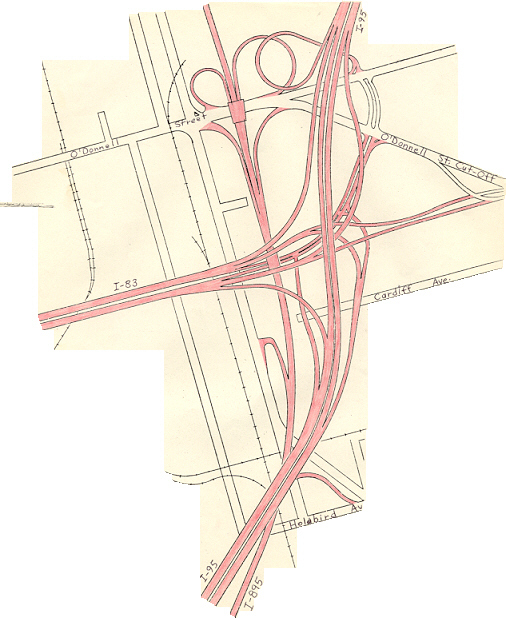 Under the original plan for freeways in Baltimore, the 1962 Baltimore 10-D Interstate System, the JFX would have junctioned I-70N (which became I-70 in 1975) and I-95, which were planned to follow an east–west route through the southern edge of the central business district (CBD), near the southeastern edge of the CBD. The JFX would end at roughly the same location where it currently does. As a result of community opposition to other portions of the 10-D System, the 1969 Baltimore 3-A Interstate and Boulevard System was adopted by the city. In this plan, the JFX would continue south along its present alignment, then turn east and pass through the Fells Point neighborhood on a 6-lane elevated viaduct, before continuing east along Boston Street to junction I-95 (which was also rerouted to its current alignment) north of the Fort McHenry Tunnel. In the mid-1970s, this plan was modified due to fears that the viaduct would result in destruction of the Fells Point area, which contains many historic properties. Under the modification, I-83 would continue south and descend into a 6-lane underwater tunnel beneath the Inner Harbor, then turn east under the Harbor, pass to the south of Fells Point, return to the surface in the Canton area and continue to I-95. Under this plan, I-83 was expected to act mostly as a northerly spur to and from the CBD, and as an easterly spur to and from the CBD; through traffic was expected to be a small proportion of the total amount making use of the route. I-83's terminus at I-95 would have been a full 3-way freeway-to-freeway interchange, with a full complement of ramps provided for access to and from Boston Street and O'Donnell Street. When construction began on I-95 through East Baltimore in the mid-1970s, a short six-lane section was built within the vicinity of the planned I-83 interchange. This was done in anticipation of I-83 connecting the CBD to I-95, the rest of which carries at least eight lanes of traffic throughout the city. By 1963 the JFX was completed as far south as Guilford Avenue, and by the mid-1970s, was extended to Monument Street. By 1983 the route extended all the way to Pleasant St, with a dead-end bridge stub indicating plans to continue south along the 3-A alignment to I-95. However, in September 1982 the segment of the JFX between Pleasant Street and I-95, a distance of 4.4 miles (7.1 km), was officially withdrawn from the Interstate Highway System. Robert Douglas, then the chief of the Interstate Division for Baltimore City (IDBC), stated at the time that the very high financial costs of the I-83 extension (estimated at $609 million in early 1980s dollars, and likely to reach $1 billion with inflation taken into account) led to the cancellation of the segment. As a result, the JFX was truncated at Fayette Street, ending at an at-grade intersection. To make up for the loss of the I-83 segment, the Jones Falls Boulevard project substantially rebuilt approximately 0.5 miles (0.80 km) of President Street between I-83 and the downtown area to provide the capacity to absorb traffic to and from the Interstate; the project was completed by 1987. Other roadways in the canceled I-83 corridor also benefited from major reconstruction and rehabilitation. The federal funding planned to be used for the I-83 extension was instead cross-transferred to other highway projects; routes that may have benefited[original research?] include I-97, I-195, I-370, and the upgrade of John Hanson Highway to I-595. As Congress worked toward reauthorization of the Surface Transportation Act, the Greater Lynchburg Chamber of Commerce and other groups in Virginia wanted I-83 extended southward to provide bypasses for Charlottesville, Lynchburg, and Danville, and to link those cities to Greensboro, North Carolina. By June 1991, Robert LaLone, director of programs for the Lynchburg Chamber, admitted that an interstate was unlikely, but upgrading of US 29, with bypasses included, is more likely. The possibility of extending I-83 (rather than Interstate 99) north to Rochester, New York was discussed at the October 2002 I-99 Task Force meeting. However, part of the proposed route on US 11 / US 15 has since been rebuilt as a four-lane surface road that does not meet Interstate standards. Expensive additional reconstruction, including new interchanges, service roads and realignments, would be necessary. The farthest north that I-83 could be extended currently would be Benvenue, Pennsylvania on a bridge over the Susquehanna River, where a recently built freeway section of U.S. Route 22 / US 322 (the Dauphin Bypass) downgrades to an undivided four-lane road. In 2005, Walter Sondheim, a prominent Baltimore city planner unveiled a proposal to tear down the elevated portion of the JFX that leads into downtown. In the JFX's place, President Street would be extended north to Eager Street, where the elevated section ends. City officials have since offered tentative support for the idea, though it is unlikely that any action will be taken until about 2020, when the current elevated structure will need an overhaul if it is to remain in use. If the downtown JFX were demolished, Baltimore would join San Francisco, Boston and Milwaukee to become among the large American cities that have removed some of their downtown elevated freeways. On May 17, 2009, the Baltimore Sun revealed a plan by Rummel, Klepper & Kahl LLP, to tear down a mile of the Jones Falls Expressway to create an urban boulevard that would help connect downtown to the east side of the city, and Johns Hopkins Hospital. From 2012 to 2015, the I-83 / PA 581 interchange outside of Harrisburg, PA was modified. Formerly, I-83 was reduced to one lane going northbound through the interchange, resulting in frequent traffic jams during peak travel times. The northbound part of the highway was widened, one bridge was replaced and several exits in the vicinity were reconfigured. A second project started in 2016, with work to be completed from its northern terminus at I-81 to just past the Union Deposit Rd. interchange. The project, expected to be completed in 2021, will reconstruct two interchanges and associated overpasses, as well as widen the highway to six through lanes. In York, PA a reconstruction of the Mt. Rose Ave. (PA 124) interchange is being completed in anticipation of a future widening of I-83 around the east and north sides of the city. Also, studies are being done North of town to help ease traffic in a section heavily traveled by trucks. Another interchange is slated for reconstruction south of York, Exit 4 E. Forrest Ave (PA 851). Exit numbers in Pennsylvania were changed in April 2001. 27.65 20 Shawan Road – Cockeysville Split into exits 20A (east) and 20B (west). Access to Oregon Ridge Park and Hunt Valley station. I-83 has only one spur route: I-283, a connector to I-76 and PA 283 southeast of Harrisburg. Interstate 83 Business (I-83 Bus.) is a short Interstate business loop in York, Pennsylvania. It begins at a semi-directional T interchange with I-83 south of York, continuing north as a freeway for 2 miles (3.2 km) before the freeway ends at a partial interchange with South George Street. The route continues north along George Street through downtown York, intersecting PA 74 and PA 462 before leaving the city and intersecting US 30. Here, PA 181 begins and runs north concurrent with I-83 Business for a short distance before I-83 Business ends at an interchange with I-83. From its designation in 1961 until the designation of I-376 Business in 2009, I-83 Business was the only business route in Pennsylvania. The entire route is in York County. ^ a b "Interstate 83 First Md. Road In U.S. System". The Cumberland News. Cumberland, MD. July 10, 1959. p. 4. Interstate 83 is the designation of the first Maryland highway to become an official part of the federal interstate roads system. ^ "Route Log and Finder List — Interstate System: Table 1". FHWA. Retrieved 2008-02-18. ^ Google (2011-03-08). "Interstate 83 in Pennsylvania" (Map). Google Maps. Google. Retrieved 2011-03-08. ^ Kitsko, Jeffrey. "Pennsylvania Highways: Interstate 83". Retrieved January 25, 2019. ^ "First Birthday Of The Greater Baltimore Committee". The Baltimore Sun. 6 January 1956. ^ "Fells Point Case". The Baltimore Sun. December 20, 1970. p. K-4. Retrieved August 9, 2018. ^ "The End of I-83". The Baltimore Sun. March 18, 1993. p. A-20. Retrieved August 9, 2018. ^ Kozel, Scott. Roads to the Future: Baltimore Early Expressway Planning URL accessed 11:38, 13 February 2007. ^ Kozel, Scott. Roads to the Future: Baltimore City Interstates URL accessed 11:42, 13 February 2007. ^ a b Kozel, Scott. misc.transport.road: Baltimore Interstate Highway Cancellation Details URL accessed 11:52, 13 February 2007. ^ Scism, Jack. "New Interstates Likely Impossible Dream." Greensboro News & Record, June 9, 1991. ^ "Aaroads - Corridor 9". Archived from the original on 24 October 2014. Retrieved 4 October 2014. ^ "Baltimore Looks Into Scrapping Mile-long Stretch Of Jfx To Help Revive East Side". baltimoresun.com. Retrieved 14 June 2014. ^ "I-83/PA 581 Interchange Bottleneck Safety Project". i83beltway.com. Archived from the original on 31 July 2012. Retrieved 26 May 2013. ^ "Bridge Construction Along I-83 Corridor to Cause Delay". Fox 43 WPMT TV. Retrieved December 17, 2016. ^ Boeckel, Theresa. "I-83/Mt. Rose Ave. Project: What You Need To Know". York Daily Record. Retrieved December 17, 2016. ^ Boeckel, Theresa. "Dangerous Parts of I-83: What's Being Done?". York Daily Record. Retrieved December 17, 2016. ^ Highway Information Services Division (December 31, 2005). Highway Location Reference. Maryland State Highway Administration. Retrieved 2013-09-02. ^ Highway Information Services Division (December 31, 2013). Highway Location Reference. Maryland State Highway Administration. Retrieved 2013-09-02. Wikimedia Commons has media related to Interstate 83. Kelly, Jacques. "JFX is a long stretch of history," The Baltimore Sun, Saturday, February 7, 2009.